Shortly after the overseas press conference, Huawei held a new product launch conference in China, bringing the world-famous Huawei Mate 20 series products to the domestic market. After experiencing the Huawei Mate 20 X for a while, we found that it has nine highlights. So it’s incomprehensible how other flagships will compete with it. This handset comes with a monster-size 7.2-inch screen, which makes it an amazing hub for entertainment. But this is not the only selling point of the Huawei Mate 20 X, as it also comes with a triple-camera, a 7nm Kirin 980 chip, a 5000mAh battery, and so on. So there is every reason to think the company wants to start a new line of large-screen smartphones that can bury the regular 8-inch tablets market. The first thing you will feel when looking at the Huawei Mate X is its hugeness. When put next to other Mate 20 series models, it stands out. When it comes to the numbers and parameters, the Huawei Mate 20 X is packed with a 7.2-inch OLED pearl full-screen with a resolution of 2244×1080. On the one hand, the border of the Huawei Mate 20 X is extremely narrow. On the one hand, the large screen and the frame form a pure visual effect. To evaluate its size visually just look at the photo below that compares the iPhone XS Max with the Huawei Mate 20 X. Although the iPhone XS Max sports a large screen of 6.5inches, it looks quite small when put next to the Mate 20 X mainly because the Huawei Mate 20 X has a narrower border and a larger screen ratio. When the Huawei Mate 20 X is placed next to a 9.4-inch tablet, we have a feeling that our protagonist is a technological product coming from the future. Honestly, we have such a feeling because the Mate 20 X has narrower frames. But what’s more important these narrow border give a unique advantage when playing games compared to traditional tablets. As the border does not occupy too much space, Huawei Mate 20 X has better controllability. On the Huawei Mate 20 X, we can still smell the thick ‘Mate breath’. The iconic element of the Huawei Mate 20 X’s rear case is the ‘matrix lens’ – the Leica triple-camera and the flash are arranged in a square shape. According to Huawei, the ‘matrix lens’ is inspired by the four-eye car lights of the Porsche 919. Today, in the era of vertically arranged dual-camera, Huawei brings us a different design, which shows Huawei’s ultimate pursuit in design. Due to the large size of the fuselage, the rear cover of the Huawei Mate 20 X adopts a large arc design. When holding with one hand, the curvature of the whole body is extremely close to the palm, and the grip is full. The back cover of the fuselage simply covers a smooth glass. The Huawei Mate 20 X sapphire blue color glass back shell adopts a new micro-scale yellow light etching process, which passes through the multilayer optical structure and the micro-filter crystal. This combination brings a texture of 40-micron depth, which is not only excellent but also has an anti-fingerprint oil. The frame of the Huawei Mate 20 X is the same as that of ordinary smartphones. It is made of metal. The left frame carries a SIM card slot. The right border comes with the volume rocker and power button. The USB Type-C interface is used at the bottom of the fuselage for faster charging. The Huawei Mate 20 X still retains a 3.5mm headphone jack on the top of the fuselage, which is quite user-friendly. More importantly, the Huawei Mate 20 X is equipped with the first batch of 7nm process chip of Kirin 980. The 7nm process technology also focuses on the powerful performance and long battery life. At the same time, the dual-core NPU design makes the phone greatly improve AI performance. In an actual test, the Huawei Mate 20 X can get 308,856 points in AnTuTu, while in GeekBench single-core test, it scores 3328 points and 9602 points in the multi-core test. The 3D Mark reaches 35,003 points. From the point of view of running data, the performance of the Huawei Mate 20 X belongs to the first echelon of current smartphones. Of course, high test scores don’t necessarily mean that you have a strong ability to deal with things. So what is the performance of the Huawei Mate 20 X when running the game? In this regard, we chose Honor of Kings and turned on the high frame rate mode. The actual experience of the phone shows it can always maintain a frame rate of 60fps. In addition to its impressive performance, the Huawei Mate 20 X also has a graphene liquid-cooled cooling system. Actually, it incorporates a combination of graphene material + VC liquid cold plate into the phone, which can quickly conduct heat and run for a long time. In order to test the thermal performance of the Huawei Mate 20 X, we continued playing the Honor of Kings for another hour and then record the temperature data. After one hour of high-intensity operation of the game, the highest temperature of the front panel is 41° C and the highest temperature on the back is 43.8° C. The hand feels only some warmness, and the running game does not appear framed. Starting from the Huawei P20 Pro, Huawei uses the Leica triple-camera design in some of its top-notch models. If you remember, this handset still leads the DXoMark least. Moreover, at the press conference, Huawei said it would not announce the DXoMark scores of the Huawei Mate 20 series, because they are too high, and the company is afraid of hitting friends. When it comes to Huawei Mate 20 X, the phone sports a new matrix multi-focus image system based on Huawei’s P20 Pro Leica triple-camera system, adding a super wide-angle lens. At the software level, the Huawei Mate 20 X lens adds more scene recognition, more powerful tuning effects, and stronger image recognition capabilities based on the first-generation AI algorithm. So even people who are not good in photographing can shoot ‘big movies’ through the Huawei Mate 20 X. In order to more intuitively see the tendency of the Huawei Mate 20 X of taking pictures, we choose the popular iPhone XR as a sparring partner. During the day, the contrast of the Huawei Mate 20 X is stronger. So the photos look more three-dimensional. In the complex light environment of the room, the color reproduction of the Huawei Mate 20 X is very accurate. It can accurately display the bright red and green color of Apple. In contrast, the fruit shot by the iPhone XR is like ‘the eggplant that is frosted’. In a low light environment, the Huawei Mate 20 X can take care of the exposure of the dark and the bright parts at the same time due to the night vision feature. The iPhone XR comes with dead black details, affecting the look and feel of the photo. As mentioned above, the Huawei Mate 20 X adds a super wide-angle lens that can bring a ‘super wide + super micro’ photo experience. Therefore, we can easily take large-scale photos identical to that taken by the professional SLRs cameras. Through the comparison of the Huawei Mate 20 X normal focal length and wide-angle photos, it can be found that the super wide-angle lens of the phone is quite shocking. It is worth noting that the Huawei Mate 20 X also supports triple optical zoom and five times hybrid zoom, which can be used to capture the beauty that is invisible to the naked eye. From the proofs, the Huawei Mate 20 X can clearly display the distant scenery, whether it is triple optical zoom or the five times hybrid zoom. At the same time, the picture still retains very rich details, and the photos with normal focal length are exposed. There are no obvious differences in color. In addition to the super wide angle, Huawei Mate 20 X can also take macro shots with a focal length of 2.5cm. A close look at the macro proofs of the Huawei Mate 20 X reveals that the macro details are amazing. The Huawei Mate 20 X runs on EMUI 9.0 system based on Android 9.0 deep customization. The biggest change of the EMUI 9.0 system is the colorful UI. It bids farewell to the color of the ‘dark black’ in the past, and instead uses a lively light color, which is very eye-catching. Due to the use of a too large screen, the first consideration for Huawei Mate 20 X is the interaction of software. 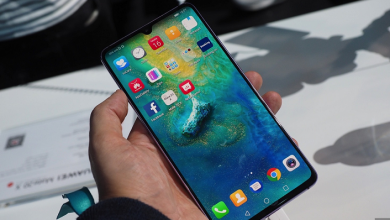 Specifically, the Huawei Mate 20 X abandoned the traditional Android three capacitive buttons, and instead, used gesture sliding interaction – swipe up from the bottom of the screen to go directly back to the home page, slide up and pause to call out multitasking, swipe from the left and right borders in to return. One of the most annoying things about fitness people is that they don’t know what’s going on in the end. In response to this problem, the Huawei Mate 20 X has added AI calorie recognition function. We only need to take the food we want to eat through Huawei Mate 20 X. Then, we can directly display the calories of the current food. The Huawei Mate 20 X is equipped with a 5000mAh battery. We conducted a five-hour heavy battery life test. As you can see, after it, the phone still remains 58% of power. This battery life is enough to make the Huawei Mate 20 X stand out in the phone camp. Another hidden danger of the big battery is that it is slow to charge. Fortunately, the Huawei Mate 20 X supports 4.5V/5A (22.5W) Super Charge. In 30 minutes, it charges up to 49%. In other words, the phone fully charges a 2500mAh battery in half an hour. Just saying, the iPhone XS battery capacity is 2658mAh. The Huawei Mate 20 X review shows this handset sports an ultimate industrial design, powerful camera, large battery, and humanized interaction. It can be said that we are dealing with a ‘bucket machine’, which has no obvious changes. In addition, the Huawei Mate 20 X did not expand the screen arbitrarily. Instead, on the basis of hardware and software synergy, the Huawei Mate 20 X’s large screen has gained a revolutionary experience. In this sense, it’s quite a new model in the smartphone market. If you are looking for an entertainment hub that is sufficiently worry-free and powerful enough, there is no doubt that the Huawei Mate 20 X is your best choice. Could you please answer this questions? How long did it take to fully charge the phone? And did you test the speakers and please make a comparison between it and the normal mate 20 pro or IPhone Xs max or Galaxy Note 9( or any of the flagship).